The Toyota Avalon (Japanese: トヨタ・アバロン, Toyota Abaron) is a full-size car produced by Toyota. 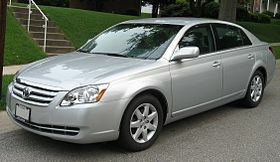 It is Toyota's largest front-wheel-drive sedan and serves as its flagship vehicle in the United States, Canada, Puerto Rico, and the Middle East. It was also produced in Australia from April 2000 until June 2005, when it was replaced in November 2006 by the Toyota Aurion. The first production Avalon rolled off the TMMK assembly line in Georgetown, Kentucky, in September 1994. A second-generation model was released in the United States and Japan in 1999.